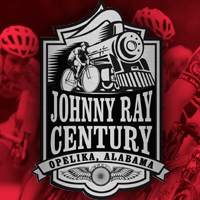 The Opelika Bicycle Advisory Committee brings you its 16th annual Johnny Ray Century benefitting the Davis Phinney Foundation for Parkinson's Disease. An initiative of the East Alabama Cycling Club, the century travels the quiet but often rough backroads of Lee, Chambers, and Randolph counties, following the famous 19th-century Central of Georgia spur. Riders cross the old railroad bed in Lafayette. The 105-mile century option takes riders into downtown Roanoke where Johnny Ray himself, its famed conductor, is believed buried. Changes to the route decrease exposure to the most rugged road conditions and busy highways. All 4 courses return past beloved Opelika landmarks as riders cruise down the city's new "Destination Downtown" Bike Path all the way back to Ride Headquarters at Trinity Methodist Church. The century is OBAC/EACC's fundraiser for the Davis Phinney Foundation for Parkinson's Disease. It donates 100% of all donations and registration fees - minus expenses for food and supplies. You may donate to the Foundation through active.com registration or directly on their site here: http://www.kintera.org/faf/home/default.asp?ievent=1138966. Davis Phinney, an olympic and professional bike racer, manages the disease himself and directs the foundation. Riders receive excellent support on the routes. Reststops feature a variety of foods and fluids. Expect special treats at select stops. Enjoy a continental breakfast including breads from Panera. A catered lunch awaits you! There's plenty of parking at and near the church. Hotel/motels are nearby and accommodating. Please see the list on the website. Let them know you're doing the Johnny Ray Century! Dri-Fit tee-shirts only to those registered on or before September 15. Helmets required. Ride goes rain or shine! The Packet Pickup Party is Friday night, from 4:30 to 7 at JamesBros Bikes in downtown Opelika. Pickup your Dri-Fit tee-shirt, number, cue sheet, and map, and stay awhile for a local craft libation from the wall o'beer. Pick up last minute gear, energy supplements or clothing as you shift into a mellow "Life in a Railroad Town" cadence. Quality Inn is again our Host Hotel (334-502-5020). Additionally, this year we're partnering with Auburn-Opelika Tourism Bureau to enhance your stay in the area. See their website for host hotels and dining suggestions: http://www.aotourism.com. 4 pm: Course Swept and Closed. See: http://www.eastalabamacyclingclub.com for more information.